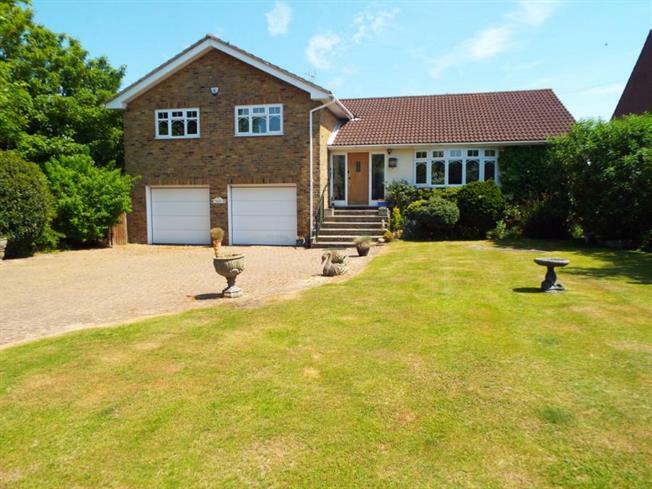 4 Bedroom Detached House For Sale in Walton on the Naze for £597,000. With views across open farmland to the front and panoramic sea views to the rear, we are pleased to offer this four bedroom detached family house, located at the popular end of The Naze in Walton, the property has spacious accommodation and an internal viewing is highly recommended to appreciate the accommodation on offer. Stairs to first floor and stairs to lower ground floor level, two radiators, telephone point and built in double cupboard. This has recently been modernised with inset sink unit, single drainer and mixer tap, cupboard below, further range of modern matching wall mounted and low level cupboards and drawers, wooden work surfaces, splash back tiling to walls, built in electric oven with seperate grill above, seperate electric hob and extractor over, integral diswasher, integral fridge/freezer, seperate island unit with further cupboards and drawers below, wooden flooring, double glazed window to side and rear and double glazed sliding door leading to the rear balcony which in turn leads to the rear garden. With enamel butler sink, range of work surfaces with cupboards and drawers below and wall mounted units, space and plumbing for washing machine and double glazed window to side. Radiator, built in airing cupboard and door leading to garage. Double glazed window to rear, radiator and double glazed door to side. With fitted suite comprising tiled shower cubicle with electric shower and shower screen, pedestal wash hnad basin, low level w.c, tiling to walls, double glazed window to side and radiator. Built in cupboard, access to loft space and telephone point. Double glazed windows to rear and side with panoramic sea views towards the Naze, two radiators, york stone open fireplave with mantel over. With fitted suite comprising panelled bath, tiled shower cubicle with electric shower and shower screen, vanity unit with inset wash hand basin, low level w.c, tiling to walls, tiled flooring and double glazed window to side. There is a large front garden which is mainly laid to lawn with large block paved driveway providing off road parking which in turn leads to a double garage, there is access via the side of the property leading to the rear garden which is mainly laid to lawn and is approximately 100ft.